Located in the Litchfield Hills about two hours from NYC, there is a quiet place surrounded by woods and lakes. Spanning 113 acres of fresh air surroundings and serene environment, Winvian Farm was built to help visitors relax and indulge their senses with the help of warmth and treats that come in the form of grand cottages, a spa and mouthwatering cuisine. Behind this estate lies the story of many families who have lived and sustained themselves through all kinds of fruits, vegetables, poultry and livestock that thrived there. Once called the Bird Estate, the place had already been an establishment for lodgers in the past. It wasn’t until 1948 when the Smith family bought the property and named it Winvian – a combination of the names of Winthrop Smith and his wife, Vivian Smith. A lifetime, eighteen luxury cottages and a suite later, Winvian Farm became the wonderful getaway that it is today, where the body can rest and the mind is free to play. At the threshold of the woodlands, there are 18 individually designed, resort style cottages and the luxurious Hadley Suite, each promising a whole new experience for guests. The spa and the 40 foot swimming pool are great spots to spend entire afternoons. 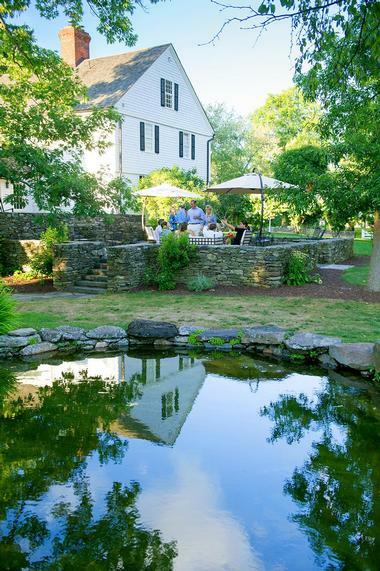 A renowned chef handles the 5-star farm to table restaurant. 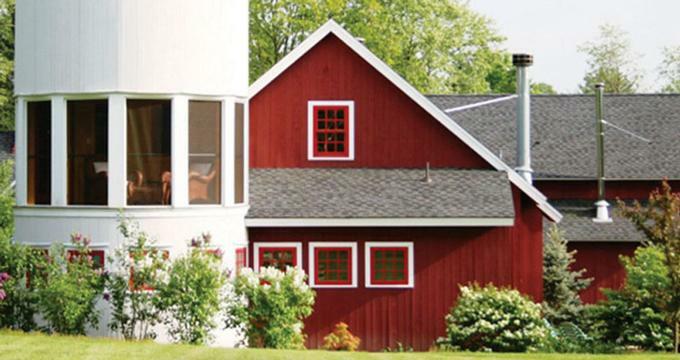 The easiest way to get to Winvian Farm is to drive from either New York or Boston. Alternatively, guests can use Wings Air Helicopters, a helicopter charter service that offers direct helicopter service on different points from the Northeast to Winvian Farm for a custom travel experience. Follow the edges of the forest to find eighteen completely unique cottages and a suite that guests can opt to stay in. While all cottages are nestled within woodlands and meadows, each one has a different story to tell. After all, these cottages have been individually designed by fifteen different architects. Artist: An entire Bungalow of charming arts and crafts contrasting the Connecticut woods and meadows. It has three airy rooms, all connected with arched doorways, and an area of 890 sq. ft. that comes with a wood burning fireplace, a Jacuzzi, and a steam shower. Beaver Lodge: A two-story cottage made of wood and stone built beside Beaver Pond. The cottage is all made of interlocking sticks with a master bed, a spiral staircase, and a table for two. It has an area of 1,250 sq. ft. with a wood burning fireplace, steam shower, and waterfall Jacuzzi. Camping: An indoor campsite that has a tented king sized bed. It has an arched ceiling that mimics the sky, such that it’s blue during the day and starry at night. It’s 950 sq. ft. and has an inside/outside wood burning fireplace, a steam shower, and a Jacuzzi tub that looks and feels like a hot spring. This accommodation is also handicap friendly. Charter Oak: This one is for honeymooners – a 1,300 sq. ft. retreat that takes the form of a very spacious silo or barn structure, built around a gigantic oak. It feels like a tavern inside, complete with a wood burning fireplace, steam shower, and waterfall Jacuzzi. In the living area is a leather sleeper sofa and a wet bar. Going up the stairs will lead to a king sized bed and another fireplace. Connecticut Yankee: Using Twain’s classic as an inspiration, this cottage has a New England clapboard theme on the outside and it is filled with rich fabrics, stunning antiques, and a herringbone fireplace that makes it feel like a king’s chamber on the inside. 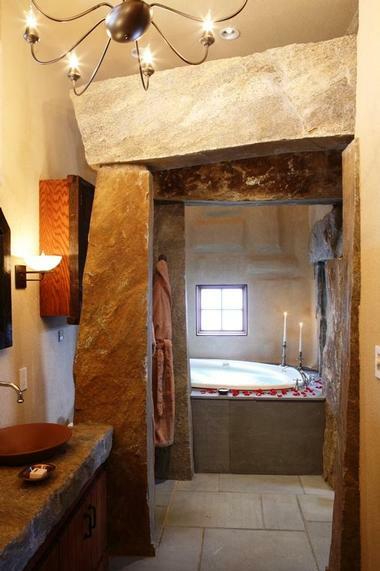 The bathroom has slabs of rock that make the surroundings of the bathtub look like Stonehenge. This 950 sq. ft. royal domain also has a Jacuzzi and steam shower, and is dog friendly. Golf: As the name suggests, this 900 sq. ft. distinctive clubhouse is the golf lover’s choice. It’s got a great view overlooking the meadows, lush carpets of green that complement the living room’s wood burning fireplace and a bathroom with a steam shower and Jacuzzi. Greenhouse: A cottage that’s great for all seasons, this 1,050 sq. ft. cottage makes the summertime or winter feel more amazing to be in. There’s wicker furniture in the living room where the fireplace is, and going through the glass doors will lead to the patio which in turn leads to the forest. 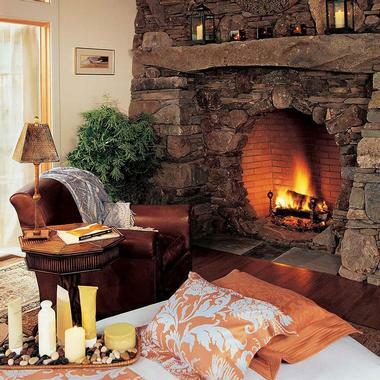 The cosy bedroom also has a fireplace of its own. Hadley Suite: A beautiful retreat set upon the 1775 Seth Bird House. It offers guests an experience with the original historical site while still having the comforts of a modern world, such as a flat screen, wet bar, Jacuzzi, and more. The 960 sq. ft. space is filled with so many 18th century icons, from the four poster bed and the crimson sitting room to every single antique. Helicopter: Guests can fly Winvian class in this helicopter themed 890 sq. ft. cottage, which actually turns out to be a restored 1968 Sikorsky Sea King Pelican. The rotor blades are embedded on the ceiling, and there’s a fuselage for an entertainment bar, a stove for a fireplace, and a cloud for a king sized bed. Industry: This one celebrates American industry and art, featuring a double sided gas fireplace, facing the living room and the bathroom at the same time. The 890 sq. ft. space is surrounded by traditional rich wood and chrome interiors as well as artefacts and paintings that represent the American innovativeness. Library: Here’s something for those who want to escape into a world of books. Filled with illustrated and literary works, this 920 sq. ft. space is lit by a skyline and fireplace and surrounded with antiques. There’s a king sized bed, a flat screen TV, and a double sided sleeper sofa. Log Cabin: This is a 920 sq. ft. traditional log cabin made from peeled log materials. The place is filled with twig trimmed furniture, mainly lit by a stone wood burning fireplace, and has a king sized bed. These are just some of the nineteen different cottages that guests can stay in at Winvian Farm. Each cottage is rated and made available on different days of the week. Headed by Executive Chef Chris Eddy, the 18th century dining room is the place for fresh and spontaneous farm-to-table dishes made of ingredients grown from Winvian’s own gardens. The wine cellar has a collection of wines from over 13 countries and 37 regions, most of which are organic and sustainable. Finally, they have a tasty collection of pastries managed by Selena Gearinger, an award-winning pastry chef. The restaurant has earned a total of five AAA Diamonds and a Relais & Chateaux membership. Fun destinations: 25 Best East Coast Beaches and 25 Best Beaches in Florida. Approximately 5,000 sq. ft. of the property is dedicated to pampering and relaxation. This is a popular luxury spa in the Litchfield Hills where there’s plenty of quiet space and sanctuary for anyone, whether they are looking for a massage or planning to take on some yoga or meditation. Guests can take time to relax in the sun lit lounge, the sauna, or take a sip of organic tea by the circular stone fireplace. Alternatively, they can relax using the spa’s state of the art facilities. This is a great place for the rejuvenation of the body and spirit. Whether guests are looking for a beautiful backdrop for a wedding or a luxurious venue for their corporate meetings, Winvian has what they’re looking for. The Main House has numerous historic dining rooms that can be reserved for a private event, including family reunions, birthdays, wedding receptions, corporate meetings and other business events. 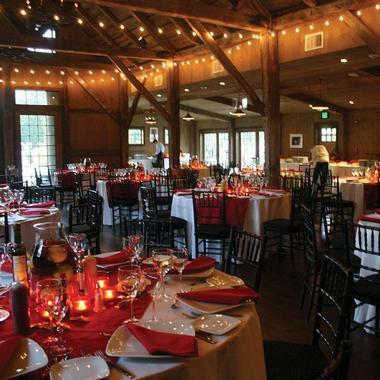 The Gordon Brown House is particularly versatile and can meet the needs of any of these events. This is thanks to hotel’s very own wedding and events planners, who work closely with the guests to make sure that everything is well arranged. All participants at the event can use the pampering facilities of the spa, taste the delicious and fresh cuisine, and rest at any of the 18 luxury cottages. Cottage rates start at $459 per night. You may also like: Great Luxury Weekend Getaways for Couples, Weekend getaways from NYC.